Whilst completing my Masters degree in Creative Writing, I was offered the opportunity, along with other writers on the course, to help produce an anthology of the groups work. This involved coming up with a title and theme for the anthology, writing material to be included in the book and then completing a cover design for the final project. I really enjoyed working with my fellow writers and being involved with a local publisher, discussing various stages of the publishing process. When the completed book was unveiled we were all very proud and began to look into marketing it. 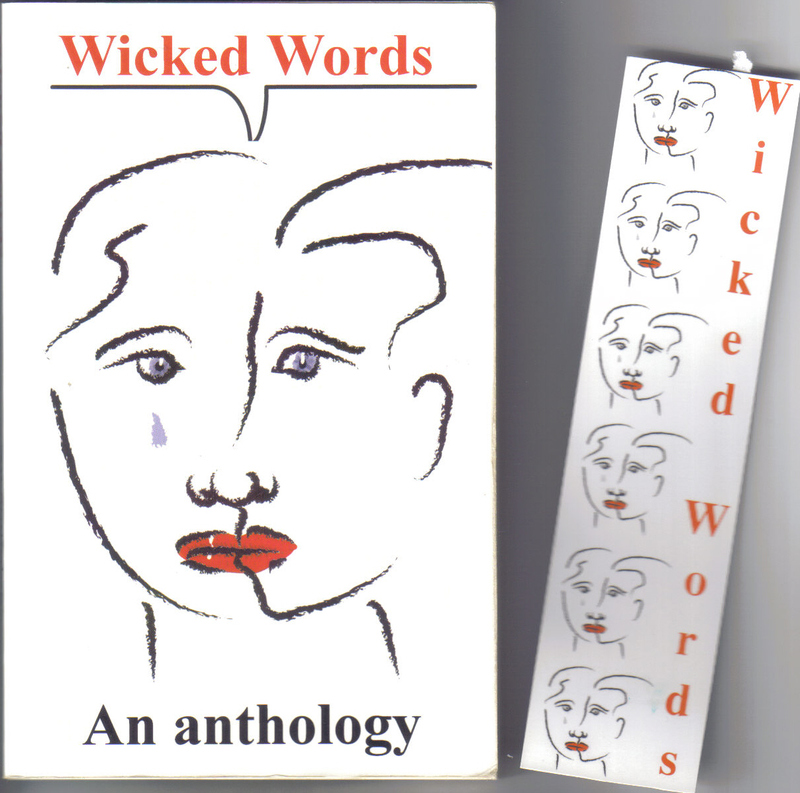 Amazon took a selection of the books and we also arranged several readings throughout Wales to promote and sell ‘Wicked Words’ to the public. 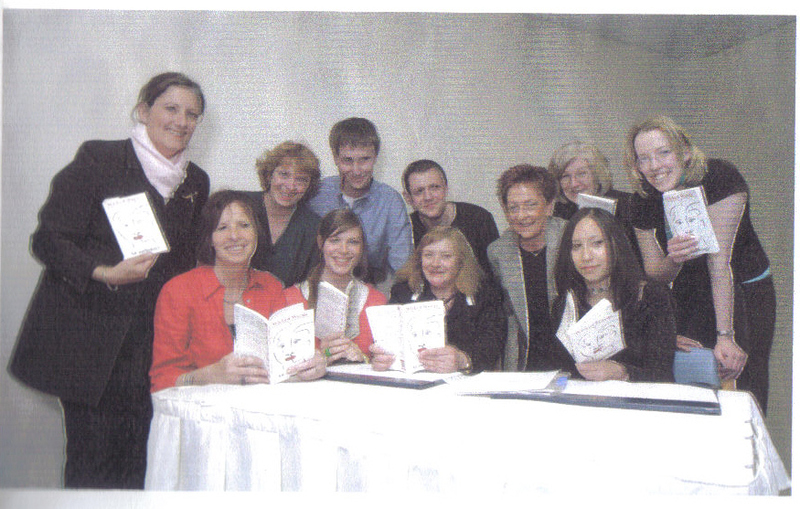 The following picture shows the team at the Launch, based at Trinity College in May 2005. I’m standing at the far right. This was the start of a tour, which visited six venues across Wales in six weeks! The other venues included Dylan Thomas Centre, Swansea, Queens Hall, Narberth, The Mariners Hotel, Haverfordwest, and kings Arms, Pembroke. Our Programme consisted of author readings, guest appearances, drinks and nibbles and then book signings by the authors. As part of our marketing we distributed posters and bookmarks across libraries, schools, and other venues across the country. This is the bookmark we designed to match the Wicked Words book cover. The reverse of the bookmark gives details of the writers featured in the book, (a variety of nationalities and backgrounds) and also information of the venues we were visiting. Our final tour date was very special to us, because it was a last-minute addition, but one which was of great importance and excitement. One of the ladies on the course had contact with Peter Florence, who is well-known creator and director of the Hay Book Festival, which takes place in Hay on Wye every summer, and attracts a wide range of people, from general public with an interest in literature, to famous writers, actors, comedians and broadcasters, such as Stephen Fry, Terry Pratchett and Jacqueline Wilson. We managed to get a slot in one of the smaller marquees, and were added to the bill! It became very real when I received a programme of the Festival and saw our names in neat italics, alongside greats such as J.K Rowling and Gillian Clarke. I am still mortified today to think that on 5th June 2005, I was sitting next to Sir Andrew Lloyd Webber in the green room for our marquee, and did not even realise who it was! Of course I knew of his work, I even enjoyed many of his musicals. And no doubt I had seen pictures of him in the papers and on television. But it took a friend to tell me of what she’d witnessed as she’d passed by the green room and looked inside, before I realised just how close I had come to meeting one of the greatest writers and composers in Great Britain! I won’t make that same mistake in the future if ever I am within a few metres of the man! Being involved in the festival was very nerve-wracking, but also very exciting! It was the first year I had ever been, and I go every year now without fail. The atmosphere is so electric. The people around you are like-minded individuals who are there to celebrate the books and the authors that wrote them as well as to discover new ones. As I took to the stand, looking out into a sea of blank faces, a few of them recognisable, I felt very nervous. But once I started speaking, it came more naturally and I felt proud to read my work to such a big and encouraging audience. 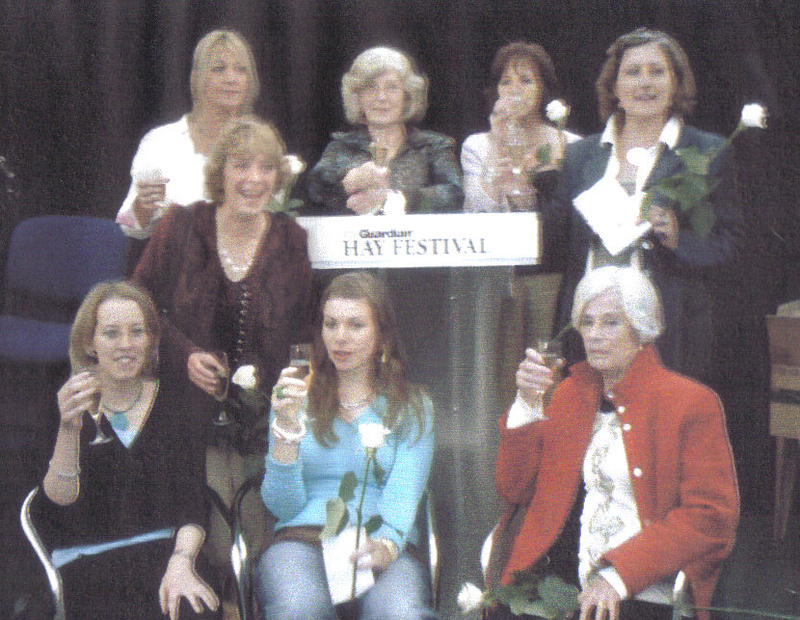 The picture below shows those of us who attended the event, we were given white roses by the organisers, which I still have pressed into an old notebook to this day. I’m sitting front left. The Book tour was surprisingly successful, with a lot of people attending the event aside from family and friends of those involved. I enjoyed talking to new people and making contacts, some very kind words were said about the writers and our book and a lot of people gave time and money to help us make a success of it. The experience taught me a lot about the business side of producing a book, of working with other writers and of the process of marketing and promoting your work. Although it was hard work and quite daunting at times, it was such an enjoyable experience. It gave me the opportunity to experience life as a published writer and firmly cemented in my mind my desire to continue on that path.